about my hometown area – the Shoals area. In 1976 the American Chemist Society erected the historical marker at 300 W. 20th Street at the edge of the Furnace Hill area, as a tribute to Furnace Hill and the chemists of the five blast furnaces that operated there in the center of the industrial Park of Sheffield, Colbert County, Alabama. The span of the years from 1887 to 1895 five blast furnaces were built on the west side of the new town – Sheffield. That was the birth of my hometown when they organized for the express purpose of exploiting the iron and coal so richly abundant in the area. Tracts of land on the Tennessee River that contained twenty-acre lots were used as inducements to encourage development of furnaces for the production of pig iron. These inducements were provided by Sheffield Land, Iron and Coal Company after its formation in 1883. 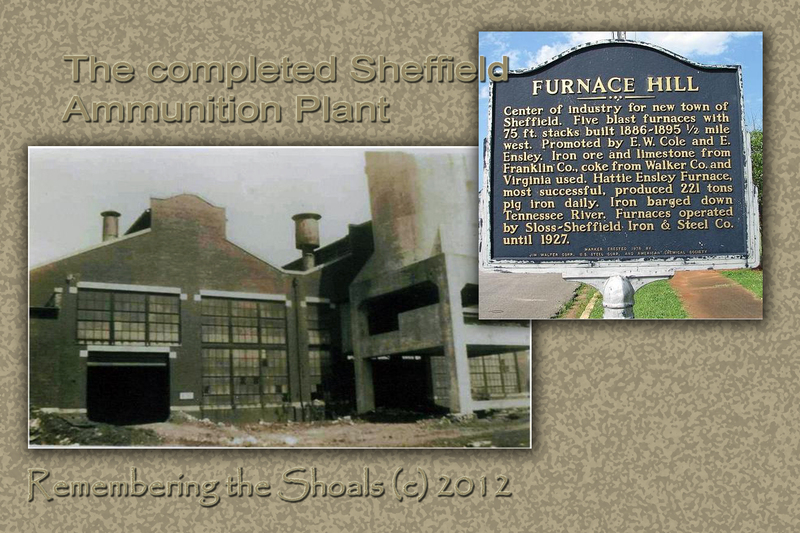 Sheffield Furnace Company grabbed up the first tract when they agreed to build one blast furnace. Three tracts were awarded to Tennessee Coal & Iron Company in exchange for three blast furnaces. Sheffield Furnace Company built the first blast furnace in Sheffield. It went operational New Year’s Eve 1887. A short three months later, Enoch Ensley (from Nashville) purchased the furnace. He was a very enterprising man and went on to acquire vast acreage in Franklin County rich in brown hematite used as ore. He also acquired the Horse Creek Coal Mine in Walker County, Alabama where a couple hundred beehive ovens were constructed to make coke for the Sheffield furnace. Prior to that enterprise the needed coke was shipped in from Virginia. Ensley’s company formed the Lady Ensley Coal, Iron & Railway Company and received the deed for his company. It later became the Hattie Ensley Furnace. Enoch Ensley named the furnace in honor of his daughter. The Hattie Ensley furnace did not cease production of pig iron until 1926. In 1888 another twenty-acre tract was awarded Ensley when he built another furnace. That furnace to honor his wife was named Lady Ensley. This furnace was blown in on 25 April 1885. Three more furnaces were to be built by the Sheffield & Birmingham Coal, Iron & Railway Company, which was formerly Tennessee & Alabama Coal & Iron Company. Completes were in 1888, 1889 and 1895. By the time of completion in 1895, the property was transferred to Alabama Iron & Railway Company, then transferred to W. W. Coke & Associates. The Cole Company then formed Sheffield Coal, Iron & Steel Company.In 1883 all the land now embraced by the city of Sheffield was acquired by the Sheffield Land, Iron & Coal Company, and in May of 1884 lots were put on sale and my hometown of Sheffield was founded. The production of pig iron ranged from 170 tons to an average of 221 tons per day. the Hattie Ensley Furnace set a record in May of 1904 by producing 6,851 tons. That is a lot of pig iron. The area schools taught chemistry since 1825, but there were no Industrial Chemist employed in the area to that date that the furnaces were opened. Of note are the chemists this industry brought into the Shoals area. Chemists who worked at the Furnace operations were: John Foster, James C. Foster, S. P. Cowardin, Marvin Garrison, Cletus McWilliams, and Frances E. Holloway. And a whole village was born that housed workers for these furnaces and future government jobs through the Tennessee Valley Authority. The Fosters were natives of Pennsylvania. Their ancestor Thomas Foster was a soldier in the Revolutionary War (DAR 5152) and ancestor William Foster served in the War of 1812. James C. Foster, who married Dee McDavid of Florence, died in 1900. He had accidentally consumed water poisoned with corrosive sublimate. It would be of great interest to those who attended Sheffield schools, that the children of John Foster and Martha Elsie Stebbens Foster were: William Anson Foster, Josephine Marie Foster, Mary Dee Foster, Anna Foster, and Martha J. Foster . Daughter, Josephine Foster, was the wife of William August Threadgill. Mr. And Mrs. Threadgill were long time teachers and principal in Sheffield Schools. When I started first grade they were at Alabama Avenue School where the Board of Education is now housed. A school bears his name in tribute – the W. A. Threadgill Elementary School, now Primary School. The school is at 900 Annapolis Avenue in Sheffield. John Foster worked in the Sheffield Furnace until 1912. He then removed to Tennessee. Later, in 1933 he went to work at the Tennessee Valley Authority as a chemist. By the beginning of World War I only one of the Cole Furnaces was operable. It did not produce until early 1918 because of legalities. The Lady Ensley Furnace was torn down in 1916, but had ceased operations in 1910. A new furnace was built to replace the Lady Ensley. The new furnace began operation in 1915 or 1916 and continued operation until August 1927. With Lady Ensley’s replacement being blown out in 1927 there came an end to iron production in Sheffield – forty years of production. Sloss-Sheffield Iron & Steel Company acquired the Ensley furances after 1891 and Enoch Ensley’s death. They went on to acquire the Cole furnaces, and another furnaces property in Florence. Eventually U. S. Pipe & Foundry acquired the properties; then ownership went to Jim Walter Corporation and it was renamed the Coal, Iron & Chemicals Group of Jim Walter Corporation. After several years of leasing the property, the property came under the ownership of U. S. Steel Corporation. Before closing the dialog on the blast furnaces of the Shoals area, there needs to be a mention of one important invention that Sheffield and the workers at the blast furnaces influenced. A Vanderbilt graduate, D. I. Miller a graduate Mechanical Engineer, invented the furnace top. He worked as Acting Superintendent at several blast furnaces including those in our area, procurement agent, foreman, and then inventor extraordinaire. The blast furnace top was designed for charging and properly distributing the material in a blast furnace. This new blast furnace top was intended for furnaces with an output of less than 300 tons per day – a perfect fit for the blast furnaces in our area. He acknowledged that he invented the new furnace top with suggestions from his co-laborers at the Sloss-Sheffield Company blast furnace. The invention was of epic proportions and his new invention was manufactured by likely the largest manufacturing concern of the time, the Hunt Company. There were furnaces in Lauderdale County as well. The Florence Land, Mining and Manufacturing Company was incorporated with a capital of $800,000 by a group of Florence Citizens on 31 August 1886. The company purchased thousands of acres in and near the city of Florence and set about the task of bringing industries to North Alabama. The Florence Land Company, a division of the aforementioned company, donated a tract of 128 acres in the city of Florence on the Tennessee River to the W. B. Wood Furnace Company, and there was the Philadelphia Furnace in Florence. In northern Alabama there were also furnaces in Decatur and Fort Payne. William Basil Wood was the leader of our beloved 16th Regiment of Alabama Infantry who fought so valiantly during the War Between the States. It is on record that because his men were so tattered and torn in their clothing, many without shoes because they had worn them out and many had rags tied on their feet in those bitter winters of the war, that he started his own manufacturing company making uniforms for them; and possibly bullets. By the time of World War I, the manufacturing of pig iron was pretty much a thing of the past. The people were desperate for industry and jobs. President-elect Franklin Delano Roosevelt addressed an immense crowd in the Shoals area from his railroad car in January 1933, and promised “to put Muscle Shoals back on the map.” He then toured the idle U.S. Nitrate Plant No. 2 and Wilson Dam with Senator George Norris. The new Congress approved Norris’s plans for development of the entire Tennessee River and FDR signed the Tennessee Valley Authority Act 15 May 1933, thereby ending years of bitter controversy about the future of the Muscle Shoals district. The nitrate plants were given to TVA for development of fertilizer in peacetime and production of munitions in wartime. FDR returned to Sheffield in 1934, to inspect the work underway by TVA at Wheeler Dam and Nitrate Plant No. 2 and again boarded his train in Sheffield. The TVA projects helped the area recover from the Great Depression, and power from the dams induced new industries to locate here. Wilson Dam was once used as a power supply center for munitions plants in World War l. For production of ammunition for use during WWI, the Sheffield Nitrogen Plant, built in 1917 was to be converted to a 90 and 105 MM Plant, as soon as possible. The J A Jones Construction Company was contracted for the construction of the building. 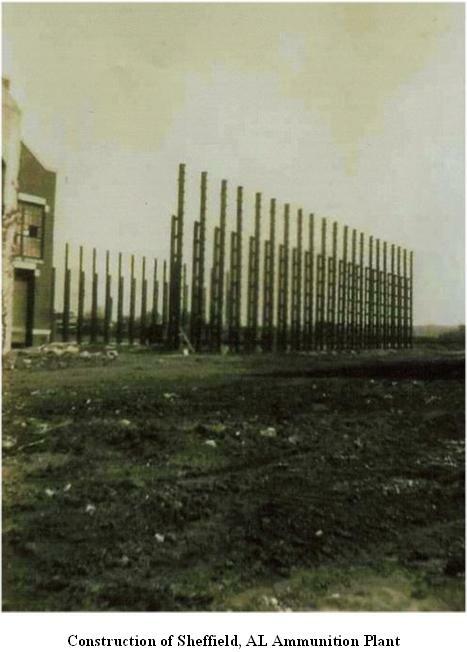 Construction went on rapidly, until the main plant was to be put in and then it was decided to cancel the entire plant because the shells were no longer needed in the war effort. Alabama Blast Furnaces written by Joseph H. Woodward is the first and remains the première source of information on all blast furnaces built and operated in Alabama, from the first known charcoal furnace of 1815 (Cedar Creek Furnace in Franklin County) to the coke-fired giants built before the onset of the Great Depression. From the rise of the iron industry in support of the Confederate war effort, to the giant internationally important industry that developed in the 1890s, the manufacture of pig iron in Alabama was the most important industry of the State and was a vital factor in the prosperity and welfare of its people. Alabama has been the site for seventy-seven blast furnaces. Four more furnaces were either partially completed or, if completed, were never operated. Out of this total of 81 furnaces 32 were built to use charcoal as fuel and of this number 10 used coke at some time during their operation. Five of these eleven furnaces were later permanently converted for coke fuel. So, it would seem Enoch Ensley and his imperialistic nature benefited the Shoals area citizens; and that Sheffield was ahead of its time in the respect to the production of pig iron using coke. Alabama Blast Furnaces written by Joseph H. Woodward. Reprinted by University Of Alabama Press, 25 October 2006. “A Record of University Life and Work,” The Vanderbilt University Quarterly, Volume 7, Number 1, page 223. Published by the University of Vanderbilt on January 1907. “Sheffield Historical Context ” written by John A Ford. Published by Sheffield History and Recollections, a Journal of Muscle Shoals History, Tennessee Valley Historical Association, Volume XVIII, pages 5-6. Published 2011. Photo of Richard Sheridan of Hattie Ensley Furnace. “Chemists will Pay Furnace Hill Workers Tribute” by Staff. Published by Florence Times Daily Newspaper, 28 March 1976, page 4 and 22.